I spent Sunday making these cookies with my two daughters. Three hours. Three blissful hours in the kitchen with my girls. They really enjoyed this activity. And if the kids are happy, then Mom is happy. I let them help me mix the dough, cut out the shapes and then decorate the cookies. Completed cookies not shown - sorry - we most definitely didn't use "clean" toppings so I was too embarrassed to show the final project. We only decorated a few so most of them will be eating in a clean and low sugar way. Excuses, excuses - I know. I love when my first time experiments with gluten, egg and dairy free ingredients turn out. And this one was a success. Not only were these fun to make but the kids liked eating them. Should you be eating these if you are on the Candida diet. No. These are for the kids. But its a fun activity to start getting you into the Christmas spirit. So pull out that rolling pin, borrow some cookie cutters from your Play-dough set and get baking! Combine Chia seeds with water and let stand for 5 minutes to gel. In a seperate mixing bowl combine all wet ingredients including Chia gel. Mix wet and dry ingredients together until just combined. It should form a ball (like dough). Let stand for 5 minutes. If it seems sticky add some additional coconut flour. Roll out dough until about 1/8 inch thickness on a piece of parchment paper. 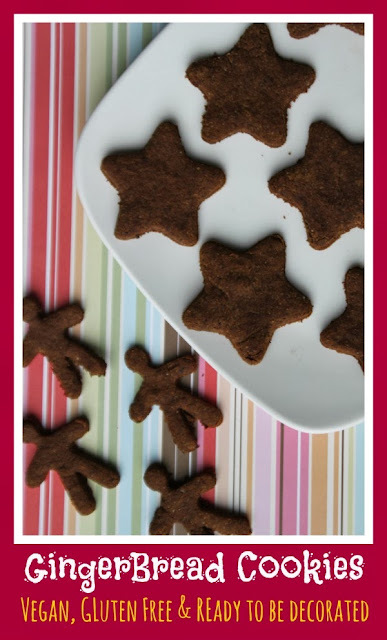 Cut shapes out of dough and transfer to lined baking sheet. I just kept reusing the scraps (forming into a new ball and re-rolling out) until there was no dough left. I let my kids choose and cut the shapes. They loved this job. This recipe is just what I was looking for in terms of ingredients! Thanks for posting! Did your cookies turn out firm? I want to make a ginger bread house and need a firm cookie. Thanks again!